The system we use is: scribe a line into the deck where the leading edge of the mast is aligned with it, when the mast is vertical. Then scribe lines at 3mm intervals aft. 3 mm aft movement from that point gives 1 degree of mast rake. 12 mm gives 4 degrees. The exact angle is not important. The important thing is that you can reproduce rake settings that you have used successfully before. You can note the mast rake on the sails themselves. The following rig settings are a starting point for sail/rig trim, at middle of wind range for rig. These are settings for IOM, but can be used as a guide for other classes. When sailing in waves expect to have the main 5 to 10 mm further out and use more camber in both sails. 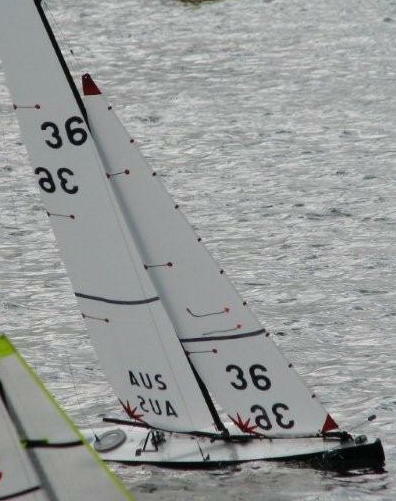 Use evenly cambered sails up to the point where heel angle exceeds 30 degrees or if excess weather helm is experienced. When that happens the backstay should be tight enough to make the upper mainsail seam straight – the leech of the upper sail panel will just begin to look slack. Sheet the headsail boom about 5 mm closer to the mast. On new boats the terminations on the shrouds at top and bottom will settle down after use and the rigging screws will need to be tightened a little more to get the same tension. When they have settled down you should take the time to set each rig up, get the mast perfectly straight sideways with the desired shroud tension (do this by checking that the mainsail leech has the same amount of twist on each gybe), and then move the lock nuts down the rigging screw ends until they just meet the rigging screw bodies. The next time you rig the boat it will be much quicker to get the shroud tension and mast attitude correct. To remove the rig carry out the same procedure in reverse order. If you do not slacken the backstay or forestay you will preserve the settings you have used for the next use of the rig. The use of these 2 controls needs to be properly understood if you are going to tune your rig correctly. The vang should be used to control the amount of twist in the mainsail leech when the main boom is sheeted out fully. The mast ram and backstay crane will have no appreciable effect when the main boom is fully sheeted out. When you are tuning your rig before racing, make this adjustment first. Be aware that when sailing downwind the boat will experience a lower apparent wind speed than the rig experiences when the boat is stationary (as you will be when tuning the rig). Therefore you will need to set more twist than seems reasonable. Check the twist with the boat sailing too. After setting the vang, sheet the main boom to the position you will use for close hauled sailing. The mainsail twist will probably not now be correct. Do not adjust the kicking strap or you will harm the setting you have just made. Instead use the mast ram in combination with the backstay and forestay tension to get the mainsail twist and luff curve that you need to achieve the overall twist and camber distribution. These alterations will not affect the down wind setting. Be aware that the rig on the boat sailing to windward will experience a higher apparent wind speed than the rig experiences when the boat is stationary (as you will be when tuning the rig). Therefore you will need to set less twist than seems reasonable. However it may be that where you tune your rig on the bank is higher than the rig will be on the water and the higher wind speed there will more than compensate for the extra apparent wind speed. Checking the sail twist with the boat sailing is the best way. Thanks to Graham Bantock for use of boat notes, which have been used here with permission, and remain copyright of Sailsetc.